One of the key reasons that prognosticators under-estimated the performance of Marvel Studios' Guardians of the Galaxy is because modern audiences haven't always proven to be up for big space adventures that aren't already part of their own established cinematic brand. In the last couple of years we have seen big budget epics like John Carter and Ender's Game completely fail to capture attention, perhaps because people weren't interested in keeping track of the special terminology and following the progression of new world building. 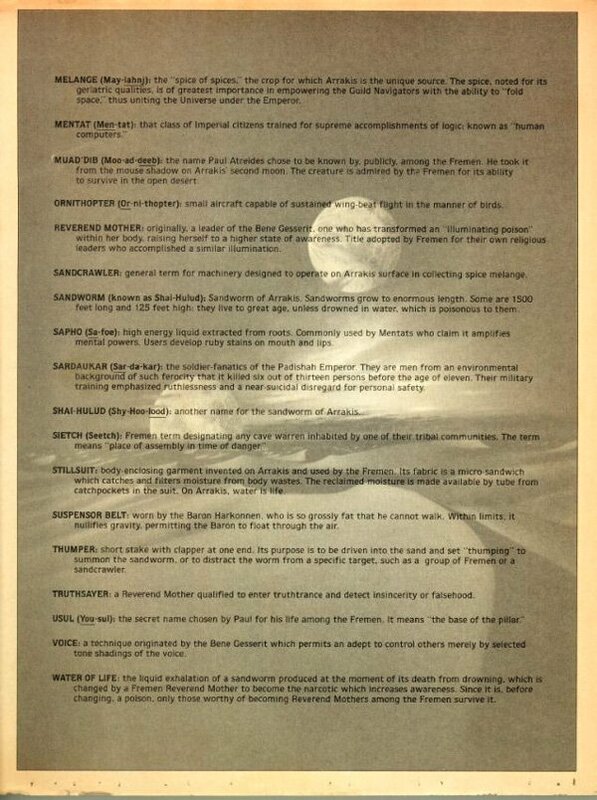 As it turns out, studios were paranoid about this kind of reaction to complex sci-fi dating all the way back to 1984, as evidenced by these Dune "glossaries" that have found their way online. "I went to see David Lynch's Dune in the theater in 1984. 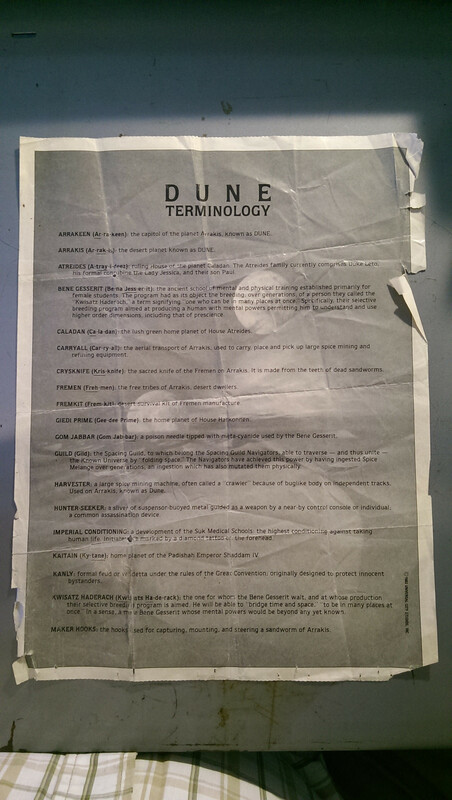 As we entered, we were given a glossary of Dune terms with our tickets. I understand this is not a common piece of movie ephemera, so I thought you might like to see it." It turns out that this little fact sheet was two pages, however, and the backside was found and posted by a man named Chris Rywalt on DVD Savant back in 1999. You can see a small version below, but head over to their site to see it in high-res. You now no longer have to go through life without knowing the textbook definition of a "Sardaukar". While I do understand why Universal felt the need to have these forms available with Dune ticket purchases, I do wonder both about a) how useful they were, and b) how David Lynch felt about them. It would be one thing if people back in 1984 were buying movie tickets way in advance and had time to really study these definitions, but did audiences really have time to learn these words in the 15-20 minutes between taking their seats and the film starting? And how did the director feel about the fact that the studio didn't believe he had done a good enough job explaining or setting up key words and phrases?